Over the last century, many regions around the world have seen a transition in the vegetation that make up the ecosystem. Many fantastic teams have worked to identify the causes of the observed woody plant encroachment; Our research groups is focused on identifying the consequences of this landscape change on leaf-, soil-, and ecosystem-scale carbon & water pools and fluxes. With Dr. Russell Scott at the USDA Agricultural Research Service Southwest Watershed Research Center, we use eddy covariance towers to monitor ecosystem-scale water, carbon, and energy fluxes. The image at the top of the page is a view from the top of one of these towers to illustrate how instruments monitor eddies, or pockets of air, to quantify changes in the concentrations of atmospheric carbon dioxide and water. * Given the transition in vegetative cover from shallow-rooted grasses to deeper-rooted mesquites, are there ﻿﻿differences﻿ in plant or ecosystem sensitivities to environmental stress? Essentially, we are asking to what degree does a change in ecosystem structure modulate ecosystem function. We know that plants that use a "C4" photosynthetic pathway tend to handle high temperatures better than the more temperature sensitive "C3" photosynthetic pathway. Those C4 plants have evolved a mechanism to limit water loss, bettering their performance, at higher temperatures. Here's the rub... the encroaching mesquites are C3 plants; However, the encroaching mesquite shrubs and trees also have deeper roots, allowing for access to subsurface pools of water not available to these grasses. Does this difference in growth form between the two plants level the playing field in terms of their capacity to conduct photosynthesis (which is required for survival!) under warm and dry conditions? 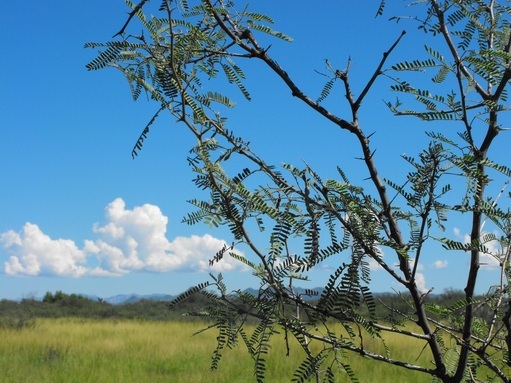 Recent results published in Global Change Biology suggest that mesquites in lowland areas are able to do much more carbon assimilation than the native bunchgrasses. Here is a drawing that summarizes this question, taken from our Global Change Biology paper. Classic temperature responses of plants with C3 or C4 photosynthetic pathway, re-drawn from Berry and Björkman (1980) and Sage et al. (2011) are shown in panel (a). Potential shifts in these assumed temperature sensitivities, given that the C3 plant is a deeper rooted shrub, are shown in panels b-d and highlight the great uncertainties in current and projected ecosystem function. We may find relaxed thermal sensitivities at higher temperatures (b), a shift in optimal temperatures beyond those limited temperature typical of C3 plants (c), an increase in maximum potential for assimilation (d); leveling the playing field among C3 and C4 plants), or some combination of these changes. ﻿* Given projections of warmer temperatures and more variable precipitation (more inter-storm periods of drought), how might these landscapes look in the future? We have found that soils under mesquites release much more CO2 to the atmosphere (soil respiration) than do soil microhabitats under grasses and inter-canopy soil spaces. These findings highlight the importance of monitoring the multiple components of ecosystem carbon flux, as measures of increased photosynthetic CO2 uptake by these trees may be offset by the increased CO2 loss from associated soils. Those findings can be found in a recent publication in the Journal of Geophysical Research-Biogeosciences.